Ja, Part Eine. As in part eine von zwei. Go ahead, Google Translate it. It means there's even more coming, but only if you're a BDN Premium Member. "I love Duke Football, but it's impossible to keep up with recruiting. There's just too many players, too many camps, too many rankings. Basketball recruiting is so much easier to follow." We hear that a lot, and it's time somebody did something about it. #dukegang is off to a great start in the class of 2013, so there's no better time to start following Duke Football recruiting. Read on for the first installment of our BDN Premium Football Recruiting update. None in the truck so far, here, but a promising start with a couple of big-time players. 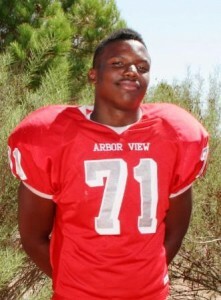 Devin Washington is a 6'2" 225 pound defensive end prospect from Orlando, FL. He took a visit to Duke a few weeks ago and came away impressed. "Duke was amazing, left a lasting impression on me. It was extraordinary! So blessed to have the opportunity to be able to have this experience." One of the highlights of his trip was being able to take his father, a big Duke fan, out onto Coach K court in Cameron Indoor Stadium. 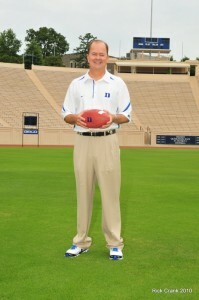 The staff remains in regular contact with him, led by Coach Cutcliffe and Coach Collins. But, before you go out and start buying Washington Duke jerseys (puns are fun! ), the Blue Devils have quite a bit of competition, which should come as no surprise for a player who has four stars after his name and recently took home DL MVP honors at the Nike camp in Orlando. 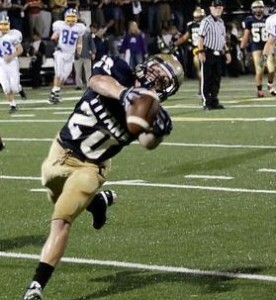 Devin picked up his 25th offer today, from Purdue. Washington is expected to put together a list of his top schools after he wraps up spring practice, and there's a good chance that Duke will make that cut, but they're likely to be joined by several others, most likely NC State, South Carolina, and UCF. Maurice Hurst is a 6'2" 275 pound defensive tackle prospect from Westwood, MA. He recently wrapped up a whirlwind college tour, and included a stop in Durham. In all likelihood, the Blue Devils have some ground to make up, but Hurst is a top-notch student and would fill a huge need in the middle of Duke's defensive line. Jaylen Miller and Jay Woods are two more of the Blue Devils' top DL targets, with Miller likely projecting as a DE and Woods a DT at the college level. BDN caught up with both earlier this spring, and the Duke staff is looking forward to hosting both prospects on unofficial visits soon. For Miller, Duke will face stiff competition from Florida and in-state Clemson and South Carolina, as well as rival UNC. Coach Jones, a South Carolina native, heads up Miller's recruitment for the Blue Devils. Woods' list of suitors continues to grow and includes national powers like USC and Nebraska, but the Blue Devils will have their shot, led by Coach Middleton. I still say Jim Collins is under appreciated for the job he has done with the linebacking corps in Durham. Year after year, he puts out All-ACC caliber players, and landed a very good one this past recruiting year in Keilin Rayner. The Blue Devils are looking to add more playmakers to their linebackers, and have targeted a few of the nation's elite so far. Michael Deeb is a 6'2" 235 pound linebacker from Davie, Florida. Deeb played his first year at linebacker as a junior, racking up 92 tackles, after starting his career as a defensive end. He is cut from a similar mold as Duke's Kelby and Kyler Brown - a big, physical specimen with deceptive speed and great instincts. Boasting a 3.8 GPA, he's earned a host of suitors, which include programs like Penn State, Vanderbilt, and West Virginia. Deeb is planning a college tour this summer, which will hopefully include a stop in Durham. Oren Burks, a Virginia native, is the other top target at linebacker, a player the Blue Devils offered a couple weeks ago on his unofficial visit to Durham. At 6'3" and 200 pounds, Burks delivers a punishing hit and is being courted by a number of programs. His HS, South County, recently produced a pair of Virginia Tech LBs, and the Hokies are among the schools to have offered the standout junior. With three of the five CBs on campus as upperclassmen, the Blue Devils will need to reload at cornerback in the class of 2013, and reloading they are. With two cornerbacks committed, Duke is still looking for more. 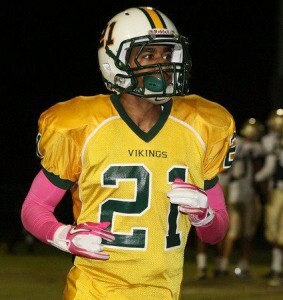 Evrett Edwards is a stud. Sure, the Blue Devils have brought in some athletic cornerbacks in recent classes, but none have the potential to become an All-ACC shutdown cornerback like Edwards. While Duke was one of the first to discover this diamond in the rough, playing for a 6-4 Woodbridge team, they are certainly not the last. Edwards recently cracked the double-digit offer threshold and shows no signs of slowing down. Several schools have stopped by to take in his spring practice, including ACC power Florida State. After his commitment to Duke, Edwards took unofficial visits to Illinois and Northwestern, which he had scheduled prior to his decision. 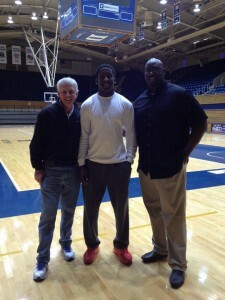 Luckily for Blue Devils' fans, Edwards appears to be a man of his word, and his commitment to Duke remains solid. Dequavais Mann is a hard first name to spell, but a very nice in-state sleeper prospect (another player on a not-so-great HS team). A player with good natural speed and athleticism, he's impressed on the spring circuit and is one of #dukegang's most vocal supporters on Twitter. He's a solid addition to the program and a firm commitment at this point. Malik Rucker is another impressive athlete who projects at either the cornerback or safety position, and a player that the Duke staff has been in on early. At 5'11" and 175 pounds from Minneapolis, MN, Rucker comes from the heart of Big 10 country, but has interest in the ACC. His cousin played wide receiver at Boston College, and another cousin played running back at Iowa State; but, with 16 scholarship offers, he's wide open at this point. Expect Rucker to take some weekend visits over the next few months and look to make a decision in the fall. Godwin Igwebuike is another athlete from Big 10 country (Pickerington, Ohio) near the top of the Blue Devils' recruiting board. With the potential to play on either side of the ball, Igwebuike has amassed over a dozen scholarship offers and is drawing interest from regional powers Michigan, Notre Dame, and Ohio State. Duke was on Igwebuike early, as Derek Jones extended an offer on a recruiting visit last December. The Blue Devils hope to get the powerful athlete on campus later this year. Jake Kite will be a force in the Duke secondary. With one commitment already on board at safety, Duke is looking to find another player or two to help fill the void left by now departed All-ACC safety Matt Daniels. With several upperclassmen poised to graduate in 2013, the Blue Devils can offer early playing time for impact players at the safety position in their 4-2-5 scheme. Jake Kite is as good as his highlight film, by all accounts. He plays smart, he plays mean, and he hits hard. This was a very good pickup early in the recruiting season for the Blue Devils, and he's a solid commitment, though plenty of other schools will come calling. Speaking of poaching recruits, two can play that game. Duke remains in pursuit of Durham's own Korrin Wiggins, a safety from Hillside HS, alma mater of Duke's Desmond Scott, Corey Gattis, and Brandon Watkins. Wiggins, of course, committed to the boys in Columbia blue in February after watching Austin Rivers bury the Tar Heels in Chapel Hill. It may be too little, too late, but Coach Middleton is leading the charge to try and persuade Wiggins to a different shade of blue. Austin Logan is a good-looking safety prospect from Tallahassee, Florida. An outstanding student-athlete, his list includes the usual suspects for a player of his caliber - Stanford, Northwestern, Vanderbilt, and Duke. Of course, there are plenty of others, but expect those four schools to be in the running for 6'1" 180 pound prospect. For the superstitious among you, that's the lucky 13 at the top of Duke's defensive recruiting board in the class of 2013. Now, I ask, was that still too overwhelming? Can't you spare a few of those brain cells you use to memorize Bachelorette contestants? Ugh, well, we tried. More to come, as we break down the top of the offensive recruiting board sometime soon. And yes, I'll work on a Football Friday, too. Spoiled rotten, all of you. 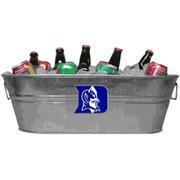 More beer, Blue Devil Nation! So, how was National Beer Day? Yeah, I bet. If only we could have that every weekend...oh wait, it's Beerfest in Raleigh this weekend. Sweet. It's also time for Football Friday. Since the Blue Devils managed to go an entire week without a commitment, there's not much new on the recruiting front to talk about. The Spring Evaluation period kicks off this weekend, and with several top prospects coming off the board over the past few weeks, the coaching staff will be out in full force to check in on prospects and extend new scholarship offers. BDN Premium Members will be the first to know about the latest on Duke's recruiting efforts. You see what I just did there? Spring practice is officially in the books, but the team continues to work to improve on an individual level. The spring semester is winding down and we wish the best to all our departing seniors, and a strong finish to the academic year to all our student-athletes. 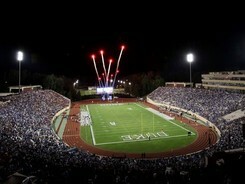 In just a few short weeks, the newest members of #dukegang will move into campus, and the preparations for the 2012 season will begin in earnest. 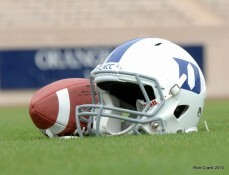 With that in mind, it's time to kickoff our look at 2012 Duke Football schedule. The scheduling gods didn't do Duke any favors, as the Blue Devils will face one of the toughest schedules in the ACC and the country. It all starts with the home opener against a tough FIU team on September 1st in Durham. Let's get this season started! Under Head Coach David Cutcliffe, the Blue Devils are 2-2 in their season openers, pulling out victories against James Madison and Elon, while losing twice to pesky Richmond. This fall, Duke opens their season with a FBS opponent for the first time since a 2007 defeat to Connecticut. In 2011, the Blue Devils traveled to South Florida in week 5 and pulled out a thrilling 31-27 victory against T.Y. Hilton and the Golden Panthers. FIU went on to finish the season 8-5, earning the program's second ever bowl game. For the second offseason in a row, Head Coach Mario Cristobal turned down multiple BCS coaching opportunities to remain at FIU. In 2012, the Golden Panthers remain a program on the rise, despite the losses of Hilton and QB Wes Carroll; with a favorable schedule, they should be expected to compete for another Sun Belt Championship. Offensively, FIU may not be as explosive as a year ago, but return enough starters to remain a formidable threat to score points. The Golden Panthers return their top rusher in Kedrick Rhodes, and four starters along the offensive line. Two young QBs, sophomore Jake Medlock and redshirt-freshman Laranzo Hammonds, are the frontrunners to take over for Carroll, and Hammonds may even see time in an occasional Wildcat scheme. Moreso than a year ago, the Golden Panthers will look to have a lot of success on the ground, making them an excellent early season test for the Blue Devils' defensive line. Other than Hilton, the Golden Panthers return all of their top receivers, led by senior Wayne Times. A year ago, the Blue Devils allowed 568 total yards to this offense, and if it weren't for a late fumble forced by Jordan DeWalt-Ondijo, may have come home with a loss. This year, the Duke defense will have to be more effective than last season's "bend but not break" effort against a very deep and experienced Golden Panther offense. Thankfully, T.Y. 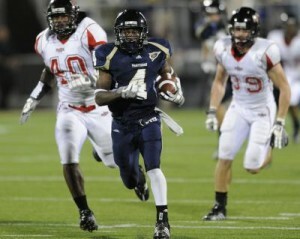 Hilton will be long gone for the NFL by September, but FIU will be just as tough. When Duke traveled to FIU a year ago, the Blue Devils' coaches were concerned about the tremendous speed of the Golden Panthers' defense. 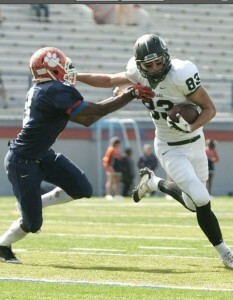 Sean Renfree and the Duke offense were up to the challenge, putting up 31 points and 384 yards of total offense. Most encouraging, however, was that the Blue Devils finished the game without giving up a sack or a turnover. As they prepare for their 2012 season opener, the Duke coaches will have many of the same fears, as the Golden Panthers return 10 of 11 starters on defense. Overall, FIU's defense was inconsistent in 2011, but did finish the season by holding their final 6 opponents to no more than 20 points. With another year's experience, this defense will be a stout challenge for the new up-tempo Duke offense. In particular, the Blue Devils will have to contain a speedy pass rush led by senior DE Tourek Williams. The secondary is just as formidable, highlighted by senior safety Jonathan Cyprien. In all, the Golden Panthers should have 16 upperclassmen on their defensive 2-deep entering the fall. This isn't a pretty picture we're painting, here, is it? Much like a year ago, the Blue Devils will have to come out of the gates ready to play if they expect to start the season with a win. A year ago, a less talented but confident Richmond team was able to steal a win in Wallace Wade Stadium. Coming off two straight bowl appearances, the Golden Panthers will be just as confident, and seeking revenge for last season's loss in Miami. Over the past few seasons, we've seen how crucial a good start can be for this improving, but still fragile, Duke program. This season will be no different, and if the Blue Devils have any hope of improving upon their 3-win total of the past two seasons, they will have to play at a high level on September 1. It should be a great atmosphere in Wallace Wade Stadium, filled with the hope and optimism of a new season, and it should also be a highly competitive game on the field. We can't wait for kickoff. WE ARE DUKE. Well, I think that the thing that attracts colleges is my height, and how they see that I adapt to what they’re trying to accomplish on the college level. My strength on the field is that I don’t give up, I don’t care if they’re 8 feet tall or 600 pounds, no game is unbeatable, that’s how I look at it, that’s how my teammates look at it. In the offseason, I went to a Nike camp recently, I’ve been working on my footwork and my hand placement, and my speed, just finding ways to get better each day. I definitely hope to accomplish going to state, I want to leave my mark on my high school, just want to help put the best team out there, that’s how I look at it. I’m looking for most in a college is education, that’s what my family is strong about, most of my family went to college. Education will get me farther than football. I’m looking for the best education that colleges can offer me. I have three from UNLV, SMU and Duke. BYU is coming to see me and I’m talking to Nebraska. But at this point, Duke is probably where I’m headed. I think I’m going to go see some sometime in the spring. I don’t know about Nebraska yet, my family is talking about a visit to Duke and some other colleges. BDN: You mentioned that Duke was a school that stands out to you; what is about the Duke program that interests you? The coaches that came to see me, I like their plans for the future about, well they’re not really known as a football school, but their mindset about making football be as big as the basketball team. I’ve been looking up their program, it just seems like they have a plan and I like where they’re going. BDN: Are there any schools that you haven’t heard from that you are interested in, or grew up following? Well, I grew up in LA and always wanted to go to USC, or maybe Oregon, but you know, those were just childhood dreams. BDN: Do you have a timeline in mind for when you plan to narrow things down or make your final decision? I don’t know, sometime around my senior year, definitely after football season, but before signing day, like a month or two before signing day. BDN: Thanks a lot, Elijah, and best of luck. Highlights from Elijah George at the Nike SPARQ Combine in Long Beach can be seen here. The Blue Devils have had a lot of success throwing the ball under Coach Cutcliffe and his spread offense over the past few seasons, including at the tight end position. With the graduation of Cooper Helfet, Duke hopes that their young tight ends Issac Blakeney and David Reeves will be able to help fill the void this fall, but the coaching staff continues to look towards the future on the recruiting trail. 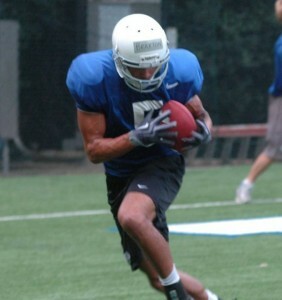 I’m mostly a wide receiver-type tight end. I like to get out in space and catch the ball, but I’ve also been used as a tackle for the youth football team, so I’m comfortable on the line and split out. BDN: What are you working on this offseason and what do you hope to accomplish this fall? Winning a state title, obviously. But personally, I’d like to see the ball more in the air and catch it and work on my blocking, trying to become a more well-rounded tight end. Definitely being able to compete football-wise, and then off the field, academically, because once the football ends, I’d like to be able to have a good job and have a degree from a very good school. BDN: Which schools have you been hearing the most from and where do you stand with offers? Who has been contacting me most would be like Vanderbilt, Northwestern, Illinois, those are like the main three, and also Boston College. Now, once I’ve visited Duke and Wake Forest, they’ve both offered me and I’m pretty liked with them too. BDN: Which schools have you had a chance to visit? I went to Duke and Wake Forest and now I’m at Vanderbilt right now. I really liked both Duke and Wake [Forest], they’re pretty similar. I’m not really sure if I’m going to see any more [schools], because they’re both pretty high up there and I’m probably going to make my decision sometime soon, maybe late summer or early fall, I’ll decide what school I’m going to commit to. BDN: What was it that stood out to you about Duke and Wake Forest? They’re both pretty high-powered offensive programs, so you’ve got to like that as a tight end, and they both pass the ball pretty well, so you’ve got to like that as a tight end that likes to catch the ball. I really liked their academics, and it’s kind of good to get away from Chicago and the snowy weather. BDN: Thanks a lot, Nathan, and best of luck. Thank you, it was nice meeting you. The goal this offseason has been on finding the "best 22" players to put on the field for the Blue Devils. Inevitably, this forces the Duke coaching staff to make some creative and difficult decisions to realize this goal. One of the most prominent changes this spring has involved Brandon Braxton, a once promising wide receiver who has selflessly made the switch to safety. Braxton's strong play on special teams the past two seasons exemplified some of his potential as a defender and tackler, but the learning curve for Coach Knowles' defense is steep. BDN caught up with Brandon after spring practice last week to get an update on his transition. BDN: How did the decision to switch positions come about? I had originally heard through the grapevine that they were switching me to defense. I gave Coach Cut a call and went and met with him, and it wasn’t for sure or anything at that point, and he said that they had been thinking about it. I told him I would be willing to switch if they thought that would improve our team, and I ended up switching and so far I like it a lot. BDN: How do you feel your skill set fits on the defensive side of the ball? I like the defensive side of the ball because it allows me to react instead of having a set play, so I definitely like that about defense. I also just like flying around and reading, so that’s probably my favorite part about defense. BDN: You’ve played quite a bit on special teams over the past two seasons, so you’ve had some experience with tackling, but what have you found to be the hardest adjustment to playing defense so far this spring? There really hasn’t been any really hard thing to pick up, but just learning the defense and knowing checks and seeing different things. Just being comfortable at safety is definitely a huge change from what I have been doing and what I’m used to. I feel like I’m a freshman all over again, learning a whole new system and getting back in the swing of things of college football. I haven’t played defense since junior year of high school, but so far I’m picking it up really fast and feel like every day I’m progressing. BDN: Now that you’re on the other side of the ball, who’s the toughest receiver to matchup with in practice? All of them are really good, honestly. Blair Holliday has been playing great. Jamison [Crowder] has been playing really good. Conner [Vernon], everyone already knows that Conner is a stud. Nick Hill is a new and upcoming redshirt-freshman and he’s been playing really good. All of them, really, there isn’t one that I can pinpoint that’s super difficult, they all have different attributes and different things that they bring to the wide receiver. BDN: You may feel like a freshman all over again, but you’re actually entering your third year with the program. What’s your assessment of the team this spring, compared to when you first arrived at Duke? This spring, well I’ve only been through two springs, but there was such a period when losing was acceptable, and I think that that whole air and people that were here when that was happening is gone. My teammates now don’t accept losing as an option. That’s the biggest thing that I’ve seen. We’ve all been working really hard and the coaches have been pushing us, and we’re all up to the challenge. BDN: The secondary is obviously a key to Coach Knowles’ defense. Can you talk a little about some of the players that have impressed you and helped you make your transition? All of them – Walt [Canty], Jordon [Byas], Anthony Young-Wiseman, they’re all veterans and they’ve all been here awhile. Ross Cockrell, we’re usually on the same side, and he’s been helping me a lot and he’s progressed immensely at the corner position. He’s turned into one heck of a cornerback. They’ve all done their part in helping me pick it up faster and teaching me tricks of the trade and making sure I do well. BDN: Thanks a lot, Brandon, and best of luck this spring. Alright, Patrick, thank you so much. It has been suggested that writing a spring update on Duke Football might help make the nightmares about mountain hawks go away, so here it is. In fact, there’s actually a lot to be excited about with regards to Duke Football. Yeah, yeah, we always say that and then we’re all disappointed come the fall. But you’ve got to see the forest instead of the trees, people! So, how can recruiting be off to a hot start? Generally speaking, you’ve got to get a prospect on campus if you have any hope of landing a commitment, and Coach Cutcliffe and his staff have hosted an impressive list of visitors already this spring. In fact, Duke has already had more than 10 members of the ESPNU150 Watch List (an unofficial list of the top 300 HS rising seniors in the country) on campus in Durham. Most recently, the Blue Devils had 9 top targets in the class of 2013 on campus for the North Carolina basketball game, including Watch List members WR Marquez North, LB Peter Kalambayi, OL Mike McGlinchey, and OL Tyrone Crowder. The coaching staff has been in contact early and often with a number of other Watch List members, including several on the West Coast, and hope to host several more visitors later this spring and summer. As you know, we’ll continue to bring you the best coverage of Duke Football and Duke Football Recruiting around. The Blue Devils returned to the field this past week to start the second half of their spring practice, and the competition level has been at its highest in the Cutcliffe era. We checked in with WR Conner Vernon earlier this week, and he confirmed that across the board, Duke is a deeper and more competitive team. The Blue Devils return 17 starters this fall, but each of those players will be pushed by younger players on the depth chart. Let’s take a look at a few examples. The Duke defense loses two of its leaders to graduation in S Matt Daniels and NG Charlie Hatcher, but there is real competition to fill their starting job. At safety, Walt Canty, Jordon Byas, and August Campbell will be projected to start heading into the fall, but they are being pushed everyday in practice by newcomer Jeremy Cash, former WR Brandon Braxton, and youngsters such as Chris Tavarez and Britton Grier. Also, it can’t be ruled out that Issac Blakeney won’t see some time on defense, as he has established himself as one of the team’s best pass-rushers last spring from the safety position. To fill Hatcher’s void up front, the Blue Devils have Jamal Bruce, along with two 300-pound players in Will Bryant (recently returned from injury) and Steven Ingram. To put it in March Madness terms, I wouldn't "go Sharpie" on anyone's starting job quite yet. On the offensive side of the ball, the Blue Devils have struggled in the red zone in recent years. The coaching staff has utilized an option style attack with Brandon Connette or Anthony Boone under center. Fans and media alike have questioned the success of this approach, as it seemed to lack creativity and often stalled drives. This year, however, it appears that won’t be the case. Coach Cutcliffe has used the “best 22 players” mantra as a focus for this offseason, and the quarterback position has been one of the most impacted. With three players with significant game experience under center in Sean Renfree, Connette, and Boone, Duke is looking at ways to put all of their weapons on the field, especially in red zone situations. Based on early returns from this spring, both Boone and Connette will not only be used under center, but also at tailback and tight end. As two of the better athletes on the roster, these alignments, if nothing else, should have fans excited for the fall. This is big-time news. Duke defensive end Kenny Anunike has been granted a sixth year of eligibility by the NCAA. Based on the ruling, he is eligible to participate in the 2012 and 2013 football seasons. A 6-5, 250-pound native Galena, Ohio, Anunike appeared in four games last fall before suffering a season-ending knee injury against Tulane. Prior to the injury, he was leading the ACC in quarterback sacks (4.0) and was credited with 13 total tackles including five for loss on the year. Anunike has not participated in spring drills while recovering from knee surgery performed last fall. Anunike also missed the 2008 season while recovering from knee surgery. He played in all 12 games in 2009 as a reserve tight end before shifting to the defensive line, where he registered 23 tackles in 12 games during the 2010 campaign. Duke rising junior Kelby Brown underwent his 2nd ACL repair on February 22, putting his health for the 2012 season into question. The revision surgery was performed on Wednesday by Dr. Claude T. Moorman III, Duke’s head team physician and the director of Duke Sports Medicine. 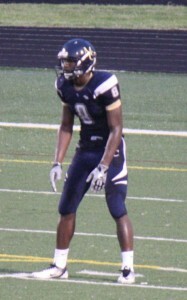 Brown originally injured the knee on November 20, 2010 against Georgia Tech, and underwent surgery weeks later. He re-injured the knee earlier in February 2012. A 6-2, 220-pound native of Matthews, N.C., Brown has played in 19 games with 17 starting assignments over the past two years. Last year, he led Duke in tackles for loss (7.0) while posting 65 total stops and received the program’s Mike Curtis Award as Duke’s most outstanding linebacker. Brown’s career totals include 128 tackles, 12.5 tackles for loss, 3.0 sacks, four fumble recoveries, one caused fumble, three pass breakups and seven quarterback pressures. In addition, he is a two-time selection to the Academic All-ACC squad. Should Kelby not be available to play this fall, he does have a redshirt year available, and would therefore still have two years of eligibility remaining. It should also be noted that WR Conner Vernon pointed to Kelby's younger (but bigger) brother, Kyler, as one of the young Blue Devils who has been most impressive this spring. Ok, so I don’t leave you in Negative Town, let’s talk about another bright spot for the Duke Football program. Since Coach Cutcliffe’s arrival, he has built the walk-on program at Duke into an asset for Duke Football. First, allow me to give you some perspective. A 5’10” 165 pound, slow-footed freshman from upstate New York enrolled at Duke a few (I mean several – ok, fine, it was over a decade) years ago, and within his welcome packet to the university, he received a letter inviting him to walk on to the football team. While I did not elect to subject my body to the punishment of collegiate football, I imagine several other equally qualified freshmen received similar letters back then, and some probably did. Flash forward to 2012, and Duke Football secures a commitment from one of the top 10 long snappers in the nation…as a preferred walk-on. Slightly different use of the walk-on program, eh? Last week’s commitment from Thomas Hennessy was just the latest among several preferred walk-ons for the program. When Coach Cutcliffe arrived in Durham, he had one quarterback to get through spring practice. This year, he has seven, including two preferred walk-ons. That’s seven QBs to practice snaps under center, seven QBs to practice handoffs to RBs, seven QBs to practice routes with WRs, and seven QBs for defenders to pass rush. Across the board, the walk-ons that Coach Cutcliffe have brought in have improved the program by allowing for more reps and more productive practices. While many of these preferred walk-ons may not make a significant individual contribution to the box score, they make their teammates better everyday in practice. Sweet, I knew I could make it through an article without mentioning Peyton Manning (he's been working out at Duke, in case you've been living under a rock). So, I haven’t forgotten about Football Friday, but my schedule simply doesn’t allow me to commit the time needed to it. But I’ll make a deal with you, since we’re all feeling down today. This won’t be the last football update you read this spring. We’ll keep it coming, as time allows. And also, we’ll have lots of prospect interviews and several updates from current players and coaches as we head towards the spring game – March 31, Wallace Wade Stadium, 1:00 PM ET. Be there. I’ll be looking for you.